to be the focal point for considering efficiency, introducing and connecting to a lesson, and lesson closure and helping students reflect on what they did in class. I decided that I was going to take my time as I add the parts and pieces. An added challenge is that I want it to be a useful tool for all of my students K-8. Being that my year is going to be about connections I decided that each part of this learning tool should be connected much like a mind map. I would need something in the center. 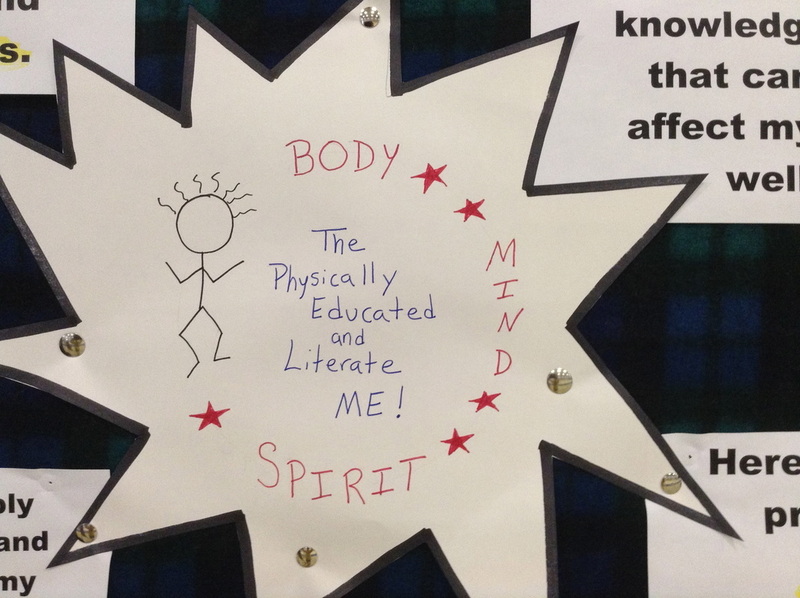 I wanted the center to be about all of my students and so I came up with The Physically Education and Literate ME - Body - Mind - Spirit. (I know I can learn to make great visuals on the computer but I like getting the markers out and seeing what I might be able to do.) Everything will build outward from the center. On this first day of school this was the only thing on the board. I used a variety of turn-to questions with the kids to explore what the image and words meant at each developmental level. Things were off to a good start. Everything has been up and running for quite some time now. I'm happy with how things are working and ready to share the rest of the board. 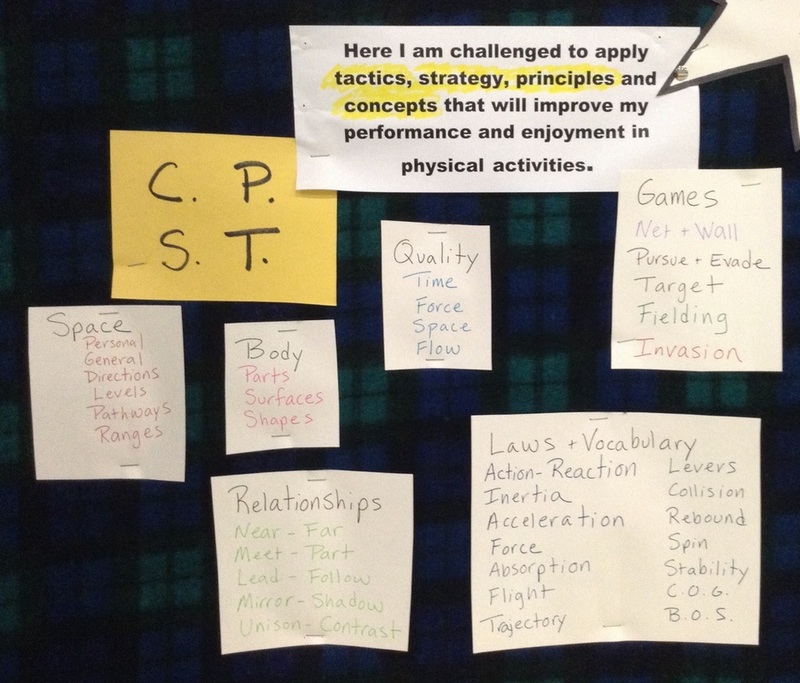 I started by adding the other 3 sections (motor skills & movement patterns, health and skill related fitness & concepts, principles, strategies & tactics) all connecting to the center - The Physically Education & Literate ME! During each lesson (K-8) I used the board to connect to the different parts of class. Then I really wanted to create a menu for each part of the board with the vocabulary I use as I teach. This also creates a sort of menu to pull from as we expand our thinking as we build learning targets and make further connections. 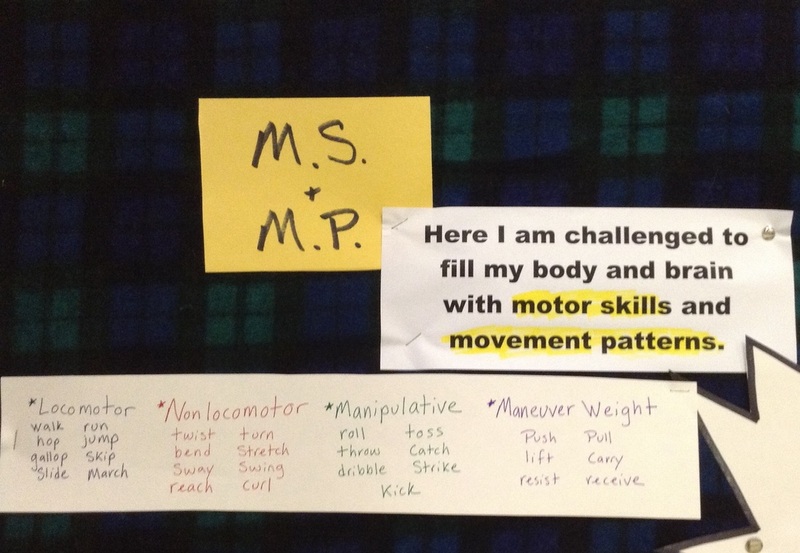 The motor skills and movement patterns includes what the body does including locomotor, manipulative, non-locomotor and maneuver weight. 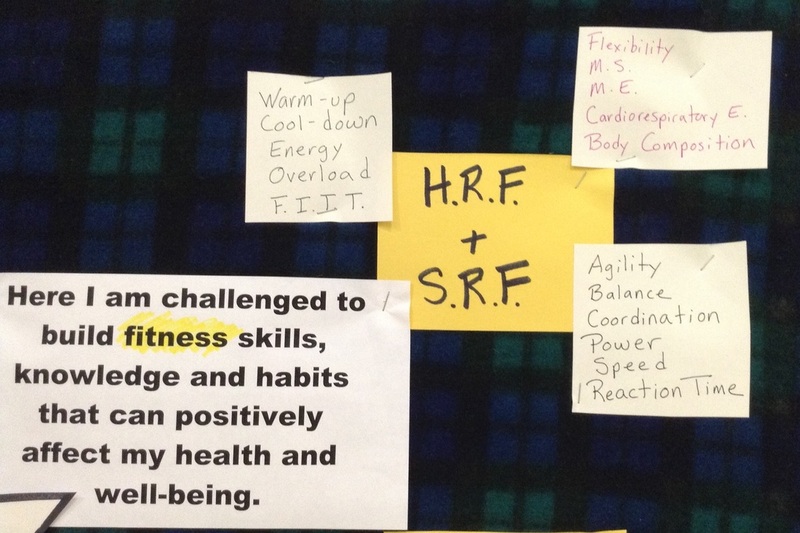 The fitness section includes health related components, skill related components and F.I.T.T. In the concepts, principles, strategy and tactics includes space, body parts, quality of movement, categories of games, relationships, laws and vocabulary. Call it what you want, skill cues or critical components. 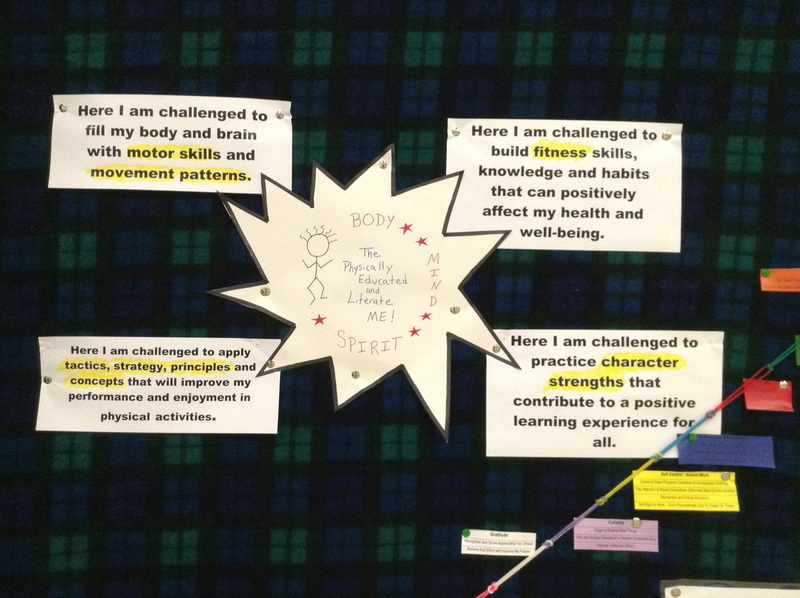 When my students are in the learning phase of developing motor skills they are thinking "body look-fors." I created this visual several years ago and it's working out very well. My youngest students are thinking about making a moving picture with all the "body look-fors" as they participate in the learning experience. When putting the learning targets up on the white board for the day it's best I don't forget the person and the glasses… I will be reminded.